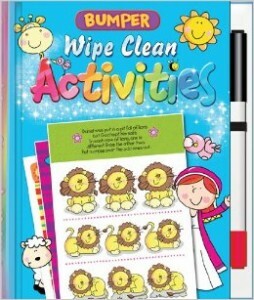 My three year old has been loving wipe clean books lately. We have books focused on all sorts of learning areas: ABCs, numbers, shapes, etc. But this one is special in that it also teaches about Bible stories, ranging from the Old Testament to Jesus’ earthly ministry. Every page has an engaging illustration, a few sentences describing the Bible event and directions for the activity, and the puzzle itself. The activities are things like connect-the-dots, simple mazes, tracing activities (for numbers and words), finding which two items are the same, marking the order of a story, searching for hidden objects or mistakes within a picture, matching, and more. Most of the puzzles are self-explanatory, so a young person could complete the activity without knowing how to read in the case that the book were used to keep a person distracted. Abraham is leaving his home. He is taking his family too. Put a cross through all the things that didn’t exist in Bible times. These fishermen called Peter and Andrew want to follow Jesus. Which line takes them to Jesus? I love that this book is relatively small (8″ x 6.7″), because it is just the right size for my little guy. It is also conveniently designed with an official place to hold the pen (the pen is included), and has a very durable hardback cover. We have used other wipe-clean style pens and crayons on the pages, and so far they have all wiped off easily. This is an excellent activity book for preschool or kindergarten aged children to have fun and work on fine motor and logic skills while also learning and familiarizing themselves with the Bible. I received a complimentary copy of this book from Candle Books.